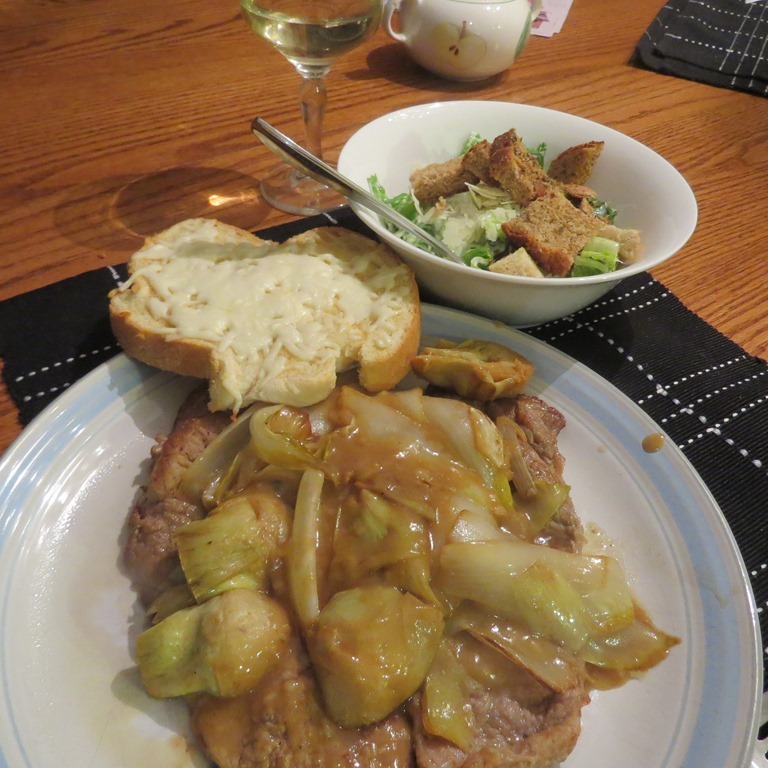 Veal Scaloppini With Belgian Endive & Artichoke Hearts | Leasa's Place. There are so many versions of this dish. Because of the title, I felt a little intimidated on trying this one. But, a personal challenge is just that, a challenge. I reviewed so many recipes and videos. I decided to just do a take on the most authentic sources, the great Italian Chefs. It is a simple dish really, very fast if you are prepared. The only twist I added was to thicken the sauce just a tiny bit. Surprisingly, the only spice in this dish is, salt, pepper and garlic to taste. 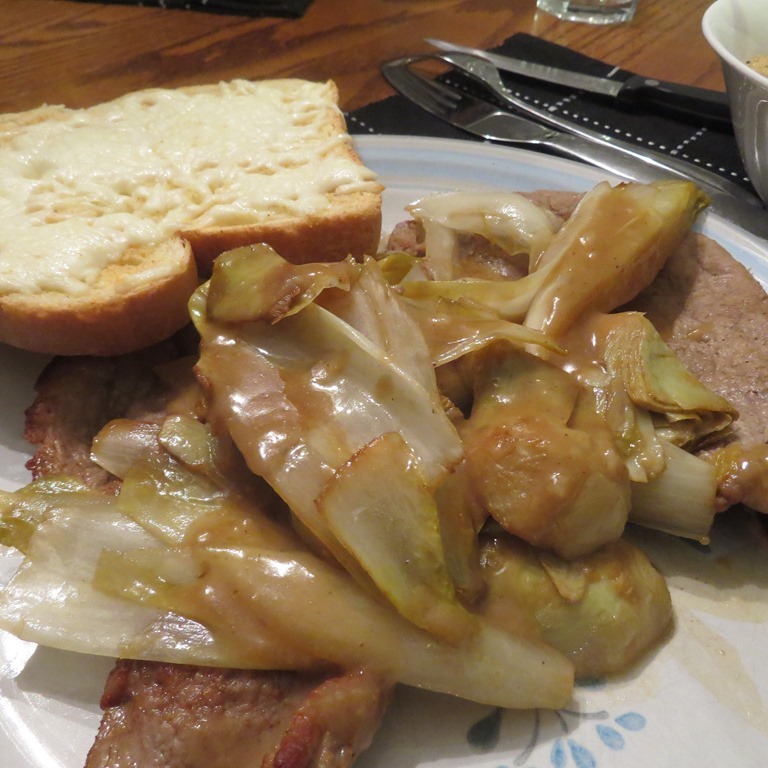 Often it is made with zucchini, but I subbed that out for Belgian Endive and found the taste and texture suited this dish wonderfully and it was a great sub, actually preferred. To start I prepared nice thick slices of home made white bread with butter, a generous amount of powdered garlic and mozzarella cheese and preheated my oven at 400 degrees convection. I set it aside. to bake 10 minutes prior to serving my dish. I also made nice side César salads. Next, I pounded out my veal cutlets until they were very thin. Then I used the meat tenderizer side to break up the fibers in the meat. Then, I salted (lightly), black peppered (more generous) each piece. I then prepared my vegetables. I could not find in Simcoe fresh artichoke so I had to settle for canned, which I think was too soft for my liking. Anyway, I rinsed them well and cut them in half. (if using fresh, clean them and pre-boil for at least 5 minutes). Then I cut my 3 cones of Belgian Endive in half and cored them Some leaves were loose but I kept the halves in tact as much as possible. I then crushed 3 nice cloves of garlic. I used my best sauté pan and added to it, 3 tbsp of olive oil and in the middle of the oil I added a heaping tbsp of butter. The protein in the butter adds to the flavour and helps the meat not stick to the pan. I heated the oil and butter on high. Then added my veal. I let it cook on one side a few minutes until it was white. Turning I also let it go about 3 minutes. I then removed them from the pan. Do not over cook your veal! Here is where you put your garlic bread in the oven, set the timer to 8 minutes so you don’t forget them! Back to the pan, turning the heat to med-high, I then added my veggies, more olive oil, about 2 tbsp and the garlic. I then sautéed them until they were fairly soft. Adding the meat back to the pan with the juice that seeped out, I also added 3/4 cup of white wine, and 1/2 cup of water and heated them through on high heat. Now, working fast, plate your meat, pile on the veggies, and I used about 1 tbsp of cornstarch and quickly whisked it into the sauce in the pan. Cover meat and veggies with sauce…and there you have it. Veal Scaloppini with Artichoke and Belgian Endive. Bon appetite! ← This is our Cream of the Crop, our Belgian Endive Soup. Sounds and looks great! I love artichokes, but forget to use them in cooking. Not a veal fan. Would you do anything differently for chicken scaloppini? I would not use oregano. It is over powering for mild flavoured dishes like this one. Also it isn’t used in alfredo for the same reason, oregano is for the stronger flavours like tomato based dishes and the like. Pound for pound veal is expensive so you want to bring out it’s flavour and not hide it. Garlic is gentle enough and complimentary. I keep meaning to bring you Belgian Endive every time I see you and kick myself because I always forget!! Belgian Endive’s core is bitter, but the leaves have a zesty-mild flavour all their own. It’s also great raw and in any salad or on a veggie tray with a nice sour cream dip. For chicken I think I would ‘alfredo’ it up a bit. I’d probably add some fresh ground Parmesan cheese to the sauce and a bit more garlic. Or, I’d make it as is with the veal but do a side of Alfredo Fettuccine. Or a combination of both.